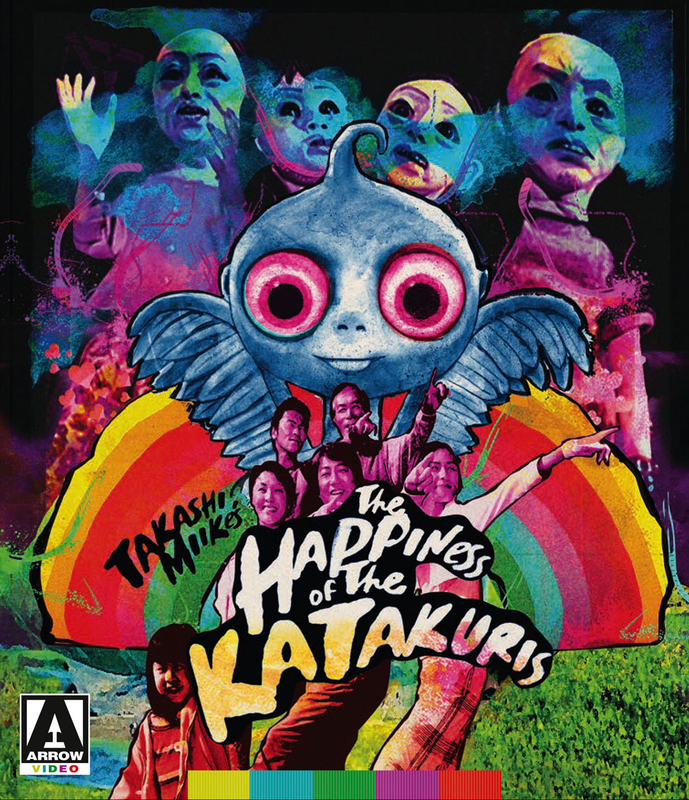 Blu-Ray Review: The Happiness of the Katakuris | "DESTROY ALL FANBOYS!" While its not anywhere close to perfect, a bit too long and not even a tiny bit frightening, it’s certainly somewhat gleefully disturbing thanks to the cheery performances by the main cast and the black comedy revolving around the mostly accidental deaths that occur in and around the family’s small, out of the way mountain inn. The Katakuris bizarre mix of live action, wild stop motion animation, mild gore and full-on musical numbers make it a knockout flick worth repeat viewings provided you like what’s here. Miike, known for more his prolific output in multiple genres as well as some truly memorable extreme films (Audition, Ichi The Killer, Gozu) infuses The Katakuris with his trademarks and adds a decidedly Japanese sense of “no matter what!” spirit that gets the family through its assorted misadventures. After a rather unusual (to put it lightly) live action blending into stop motion opening sequence, the plot has to do with the titular family struggling to run an inn in a low traffic tourist area and what happens when visitors finally start showing up and expiring on the premises. Mining death for laughs isn’t a new thing in film at all, but you have to give Miike and his talented cast credit for making the assorted demises and the family’s reaction to them work so well. Those bodies get buried nearby and yes, they do make a return as zombies later on. But this is about a much of a zombie flick as Alvin and the Chipmunks as those undead get in about five minutes of late screen time before vanishing from view. The film is more focused on the family getting through its troubles and sticking together despite any obstacles. There’s a song and dance sequence for every emotion displayed here. There’s a body in that room? Here comes a musical number! The divorced daughter who finds love in the form of a shady “sailor”? EXCELLENT musical number! The song and dance stuff is wonderful, weird and according to the interviews in the special features, intended to be a bit unpolished because the family is just a family and not well-trained actors going through their paces. For all the tunes and different musical styles on display, the film’s main fault is it’s a wee bit too long, dragging out parts of the story that would only entertain someone from Japan who was in on all the jokes. The best parts of the film are the wacky stop motion and other animated elements that may have been done as a purely cost-cutting measure, but boy, do they spice up some of the mid-to late moments where mere stuntmen or more expensive sets and CG effects would have been used in other films with bigger budgets. After watching this film for the first time over a decade ago, I was hoping that Miike or some other director would take what worked, compost down the rest and make a tidy, fun musical along the likes of The Rocky Horror Show or Sweeney Todd: The Demon Barber of Fleet Street. But as far as I can tell, that hasn’t happened. In other words, as with most of Miike’s output (seriously, the man must inhale scripts and exhale complete celluloid works), you need to take the good and bad on equal terms and sift out the enjoyable parts. That said, the good thing is an American director hasn’t attempted to “Hollywood” this one yet (as far as I know), so there’s nothing stinking up cable or a streaming site that’s being called a “poor man’s Happiness of the Katakuris” (or “a poor man’s The Quiet Family”,for that matter). Then again, I tend to avoid streaming sites because I don’t have the bandwidth and I happen to love my special features those sites avoid running. Of course, given that Arrow Video excels at those special features, the Blu-Ray of The Happiness of the Katakuris has got the goodies you’d expect from the company. When he’s not whipping out films, Miike’s giving chipper interviews where he goes into detail about his process, so you get him chatting away amiably here. He does the commentary track for the film and even appears in a few of the other features on the film’s stop motion effects and an older documentary on the making of the film. A bunch of trailers and TV commercials round out the package and those of you who get the retail version (and not a plain review disc) will get a lovely package with reversible cover art and a feature-packed booklet. While it may not be without its flaws, there’s no doubt that The Happiness of the Katakuris will be a film that’s enjoyable on a number of fronts and polarizing on a few others. Just take in the craziness and the colorful numbers with an eye on seeing the film from a Japanese perspective. Going in with expectations of greatness isn’t the best way to approach a Miike flick anyway. Just go in expecting to be surprised and that’s how you’ll end up if you stay in that mood throughout your little trip to the mountains. Now that I think about it, I wonder what Tim Burton could do with this story? Maybe not another musical (because this one’s so unique), but taking it back to pure black comedy just might be one way to go if this one’s ever to get a proper American remake. This entry was posted in 2015, Commentary, DAF, Features, Holiday Gift Guide 2015, Humor, Updates and tagged 2001, Arrow Video, Blu-Ray/DVD, BUY THIS FILM!, Gifts, Horror, Horror Films, Imports, Japan, Mature, Movies, MVD Entertainment Group, Not For The Kiddies!, Reviews, Takashi Miike, The Happiness of the Katakuris by geelw. Bookmark the permalink.